The Vivoactive $250 is Garmin's strong answer to the Apple Watch. By not including a GPS in their initial watch, Apple left a small door open for competitors focused on harder core running and cycling. Why they didn't include GPS I am not sure and we surely will not be surprised in the future by add on GPS battery bands, increased accuracy of synchronized pedometer function to GPS, etc...in the Apple Watch. I had an Apple Watch on order but cancelled it as I could not wait. 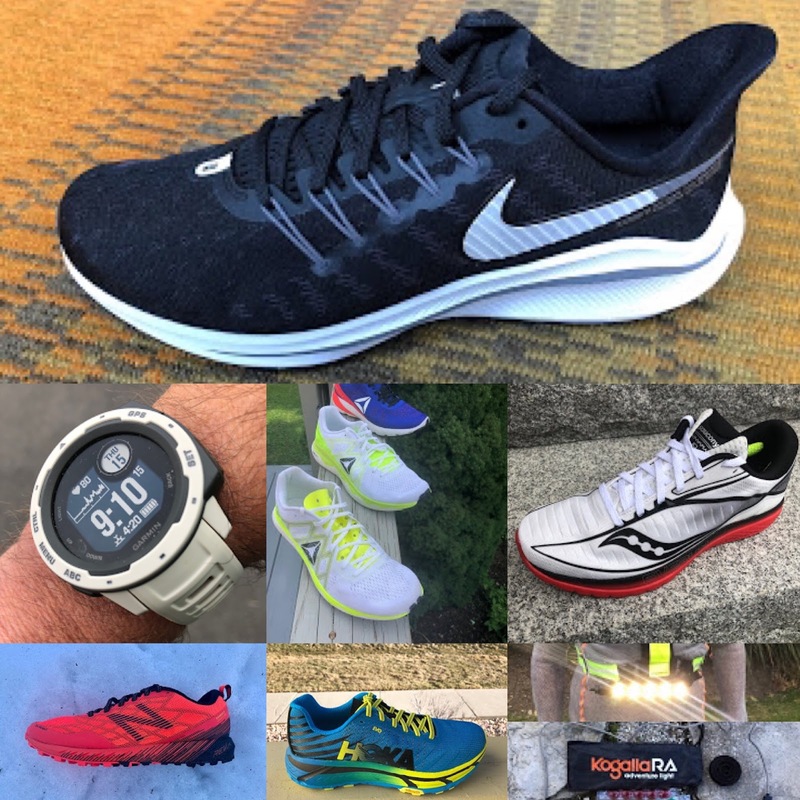 My trusty Magellan Echo, a dumb watch with 5 month battery life displaying and controlling my iPhone iSmoothRun app drowned at the Boston Marathon, literally, in all the rain and the screen went dead a few days later. I have now run with the Vivoactive for 2 weeks and am very pleased. It has not come off my wrist except for a charge every 3 or 4 days. What makes the Vivoactive such a strong contender for athletes, everyday use, and more generally as Garmin says "the active lifestyle ? GPS is on board with quick acquisition and decent distance accuracy. I am finding an average of 1.31% shorter distances over 3 runs total 23.5 miles vs. iPhone GPS and iSmoothRun app. I will run it in parallel on a wheel measured course, compare, and update. Vivoactive currently uses "Smart" recording vs. 1 second sampling to save battery life, I assume. I expect accuracy to increase with firmware updates and potential settings for more sampling. After all the GPS chips are likely all the same. The Vivo does have a setting to include the Russian GLONASS network in the readings along with the US GPS network. I tried this for one run and it seemed to, as expected drain the battery faster. Vivo has superb battery life. It truly is s an everyday watch. I got 84 hours of use including almost 4 hours of running and still had 41% battery left. Never have to take it off when you actually need it. Very thin and light, good aesthetics if a bit modern for my taste in watches. Phone notifications (calls, texts, emails, any other app you have set up to notify), find my phone beacon. Adequate and customizable (with some difficulty) for multiple activities including swimming and even golf. Comparison of my Vivoactive sleep movement statistics before (left) my disaster 25K trail race and more recently(right) as pollen subsided. Nascent "mini" watch app and widget platform at Connect IQ. Included are a notifications, weather screen, step count, upcoming events screen and music control. I added a new data field for 30 second pace, time of day, HR from the Connect IQ. Garmin Connect online dashboard which to me is more "fitness" lifestyle oriented than performance oriented. What are some of the limitations of the Vivoactive for it to be considered a full blown fitness plus everyday smartwatch? Of course some of these may not be important to you. low light readability as an everyday watch without backlight is not great, something had to give to get the battery life. The Vivo does not auto dim to save battery life and wake up on motion as the Apple Watch does. limited communications back and forth to phone. beyond music control and sending stats back to the Garmin Connect app, the Vivo does not allow responses to notifications, answering phone, speech recognition, etc.. as the Apple Watch allows. It also does not have a speaker, mic, or onboard music storage that I can see as Apple Watch has. awkward set up of screens and settings when compared to the the ISmoothRun app I used to configure the Magellan. The Vivo seems to live between 2 worlds: the dedicated GPS watch and the app connected watch. I would like to see both methods of configuring and maybe this will come. For example way to set the number of data fields to less than 3 on a data screen I could find for easier viewablity. one size fits all vibration alerts and no audio alerts Apple Watch's Taptic Engine once integrated into fitness apps will provide all kinds of feedback variety: different taps for on pace, another for above, below, drink, eat, etc. Several complained online that the vibration alert (mile splits, emails, texts, etc...) is to faint to detect. Initially I wore the Vivoactive on my right wrist and found vibration alerts just fine. I shifted the Vivo to my left wrist and found them so faint as to be useless. When I shifted back to my right wrist they were more easily felt. On the watch under settings>system>there is a way to set the vibration to "Long". Under user settings in the Connect app a choice of left or right wrist. I was set to right which may be why when on my left wristI wasn't feeling anything much. I highly recommend the Vivoactive as a general purpose everyday and GPS running and fitness/wellness watch. Geek that I am, I will eventually order the Apple Watch and look forward to comparing to the Vivoactive. 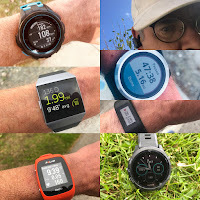 If you want an in-depth review of every nook and cranny of the Vivoactive I refer you to DCRainmaker's always excellent in-depth review here. 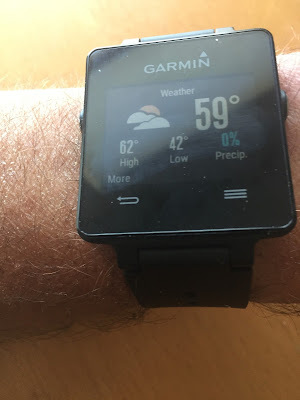 The Garmin Vivoactive was a personal purchase at retail. as well as Backcountry.com and City Sports at the links below. Purchases via these links support my blog. Thanks! I've had mine for a couple of months and really like it. Can't think of a better solution for the traveling runner. The music control for iPhone users is an epic fail. Hard to use during an athletic activity and can only control Apple's music app, not Slacker, Spotify, Pandora etc. If you have lots of potholes during a drive, you will get extra bonus steps. I typically charge it when I'm driving instead.